Choose your own flights to cuba! 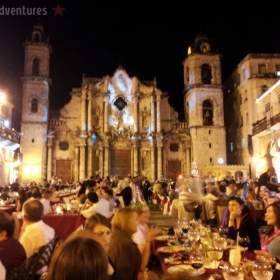 All of our tours start and end in Havana. This gives you the freedom to choose the route to Cuba that is most convenient and economical for you. We can arrange your travel from CUN to HAV including visa. Request this with your reservations agent directly after you have booked. There is a 15% charge for this service. For help from a travel agent, one option is to contact Alan with Please Yourself Travel (pleaseyourselftravel@gmail.com), he has booked many flights to Cuba for our customers and can arrange commercial flights to Cuba departing from the US as well. SEARCHING TIPS: On Kayak.com you can now search flights to Cuba, but not on Expedia or Orbitz. For information on medical insurance and visa, look on the airlines' website rather than calling the airline. Airline agents are usually not well informed about Cuba specific travel and often give incorrect information. What we provide here is for informational purposes only, we are not responsible for the accuracy of this information. You should always contact the airline or charter companies directly for all questions and concerns regarding flights to Cuba. We encourage you to follow Cuba Travel Surge (Facebook) or Havana Urban Adventures (Twitter & Facebook) for updates on the flight situation. *All of these flights to Cuba include mandatory medical insurance - you should not purchase insurance from us if you are flying directly from the US. Visa- sold by Cuba Travel Services $85 in advance (online), $100 at check in. Another option is to book a commercial flight to one of the provinces. The closest to Havana are Varadero and Santa Clara. You can view the full list of airline service to the provinces on the Department of Transportation website here.